Whether or not you’re a Southerner, it’s no secret that biscuits in the South are a way of life. Born out of necessity and frugality, biscuits provided a high-calorie breakfast for those who worked a lot and did not have much to spend on meals. Now our nostalgic and familiar staples are found in nearly every Southern restaurant and home kitchen. The culinary creativity with biscuits has expounded into much more than a slather of gravy and jam (although this is still a fantastic way to enjoy them). 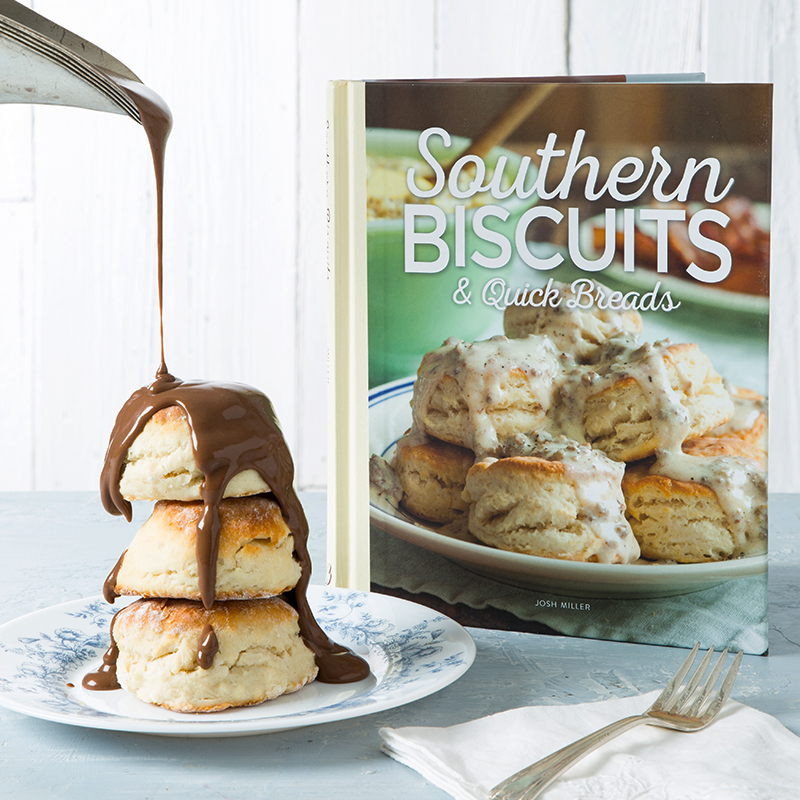 This Southern Biscuits & Quick Breads book is just that—a marvelous mix of tradition and innovation! Among staple, good-for-every-occasion drop biscuit and angel biscuit recipes, creations with ham, cheese, berries, chocolate, and much more fill this book! A personal favorite of mine is this Cheese-Pepper Biscuit. I love that these particular biscuits are a square shape. And we talked about embracing change a couple weeks ago, so switching things up is a good thing…right? A simple knife will do the trick here, so no worries if you don’t have a biscuit cutter. 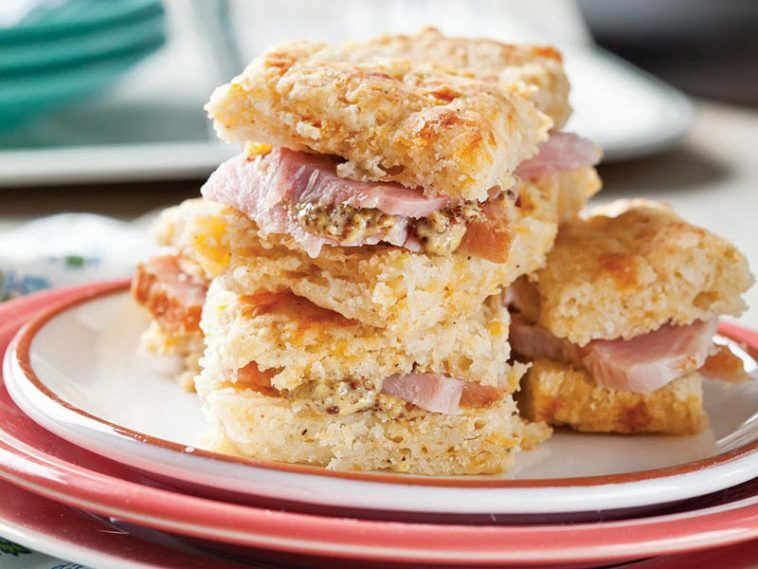 The savory ham and tangy stone-ground mustard perfectly complement the rich and cheesy biscuit. Wherever you take these, I guarantee you’ll have people asking for the recipe! In a large bowl, whisk together flour, baking powder, salt, sugar, black pepper, and red pepper. Using 2 forks or a pastry blender, cut butter into flour mixture until crumbly. Make a well in dry ingredients; add cheeses and ¾ cup buttermilk, stirring until mixture just comes together. Add remaining ¼ cup buttermilk, if needed. On a lightly floured surface, gently knead dough 4 or 5 times. Roll or pat dough into an 8-inch square; cut into 25 squares. Place close together in a 10-inch square cast-iron skillet or a parchment-lined baking sheet. Bake until golden brown, about 17 minutes. Let cool for 15 minutes. Using a large spatula, remove from pan, and cut into pieces. Split biscuits horizontally, and brush with melted butter. Serve with mustard and ham, if desired. For a limited time, this quintessentially Southern cookbook is available at a special price. So, whether you want to add to your own cookbook library or give this treasure trove of deliciousness to a friend, click below to pick up a copy! I love biscuits! My mother told me my grandmother made 100 biscuits every morning for years for her family of hard farm workers! Can you imagine? When I was little and at their house, the best snack was always a biscuit. We pushed our finger down the side into the biscuit and poured in maple syrup! Pure Heaven! If you haven’t tried Callie’s Charleston biscuits, you must. You can get them online. Even their packaging, with Southern sayings on it is delightful! For Christmas, my best friend sent us 3 packages: chives, cheddar, and ham biscuits. The ham biscuits are to die for! Sourdough are good too and my Mom used Bisquick a lot too! My mother used to make the most scrumptious, fluffy biscuits from scratch. When I got married, my husband mentioned how he loved homemade biscuits. Wondering why I had never known how the biscuits were made, I called Mom to ask for her recipe. I was so disappointed to find that she had only used Bisquick and their recipe to create these wonderful treats for so many years! I laugh about it now but it wasn’t funny to me at the time. 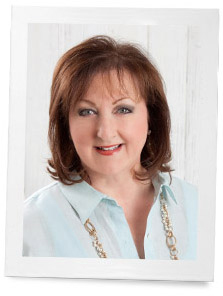 I am really looking forward to trying the biscuit recipe you have included on your blog today. Thank you for that! Mmmmm! I love a tender biscuit with good warm ham on it. These cheese biscuits would be oh so good. Thanks for the recipe. I’ve already printed it out.